A Tour of the White House with Mrs. John F. Kennedy was a television special featuring the First Lady of the United States, Jacqueline Kennedy, on a tour of the recently renovated White House. It was broadcast on Valentine's Day, February 14, 1962, on both CBS and NBC, and broadcast four days later on ABC. The program was the first ever First Lady televised tour of the White House, and has since been considered the first prime-time documentary specifically designed to appeal to a female audience. The film showed Kennedy on a tour of the house with the CBS News correspondent Charles Collingwood. The filmed tour was the first glimpse the American public had had of the $2 million restoration of the White House that Kennedy had helped direct in the first year of her husband's presidency. The program was viewed by 80 million viewers, and globally syndicated to 50 countries including Russia and China. Kennedy's notes for the televised tour were among her personal papers that were publicly released by the John F. Kennedy Presidential Library in 2012. The papers showed that Kennedy made sure that the names of individual donors who had contributed to the costs of the renovation were included in the script. Kennedy had been the First Lady of the United States since her husband's inauguration in January 1961 and had engaged in a well publicized restoration and redecoration of the president's official residence, the White House, in the first year of her husband's presidency. Kennedy had been approached by various television networks to broadcast the restored White House and it was subsequently agreed that the three major American networks (CBS, NBC and ABC) would jointly fund and broadcast the resultant documentary. The finished documentary was produced by Perry Wolff and directed by the feature film director Franklin J. Schaffner. The orchestra conductor Alfredo Antonini served as the program's musical director. Cutaway segments for the film were shot in advance and Kennedy's parts were taped in an eight-hour recording session. 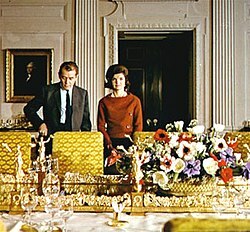 Nine short tons (8.2 t) of equipment were required for the film, placed in the White House by 54 technicians. The success of the film led to other documentaries aimed at a female audience including The World of Sophia Loren and The World of Jacqueline Kennedy and Elizabeth Taylor in London, all of which drew significant numbers of viewers. The success of the film of Kennedy's White House tour has been analyzed from a feminist film perspective, as it appealed to "women's fantasies about living a more public life while largely maintaining their conventional feminine attributes" as television could allow the female viewer to "fantasize about situations and identities which are not part of one's everyday existence", anticipating the new possibilities for women in the latter part of the 1960s. The success of the program inspired Grace Kelly, by then Princess of Monaco, to make a filmed tour called A Look at Monaco. Kennedy and Perry Sidney Wolff co-authored a book with the same title, based on the documentary film, published by Doubleday in 1962. The film won Schaffner the Directorial Achievement Award for 1962 from the Director's Guild of America, and Schaffner and Kennedy were both recipients of the Trustee's Award from the Academy of Television Arts and Sciences for their work on the film. Schaffner would later be asked by President Kennedy to look at the lighting and acoustics in the State Department's Auditorium, the site of his press conferences, and was asked to help prepare Kennedy for his address to the nation at the start of the Cuban Missile Crisis. ^ a b c d Michael Curtin. "Television". A Tour of the White House with Mrs. John F. Kennedy. Museum of Broadcast Communications. Retrieved April 7, 2015. ^ a b c d "Jackie Kennedy's devotion to White House revealed". CBS News. February 14, 2012. Retrieved April 7, 2015. ^ Troy, Gil (2006). "Jacqueline Kennedy's White House Renovations". In Watson, Robert W. White House Studies Compendium, Volume 2. Nova Publishers. p. 319-326. ^ a b Horace Newcomb (February 3, 2014). Encyclopedia of Television. Taylor & Francis. p. 2021. ISBN 978-1-135-19479-6. ^ "Television". The Australian Women's Weekly. National Library of Australia. Retrieved March 12, 2015. ^ Kennedy, Jacqueline; Wolff, Sidney Perry (1962). A Tour of the White House with Mrs. John F. Kennedy. Doubleday. p. 258. Retrieved 22 April 2015. ^ John A. Barnes (2007). John F. Kennedy on Leadership: The Lessons and Legacy of a President. AMACOM Div American Mgmt Assn. p. 76. ISBN 978-0-8144-7455-6. ^ Gary Edgerton (August 13, 2013). The Columbia History of American Television. Columbia University Press. p. 227. ISBN 978-0-231-51218-3. This page was last edited on 24 December 2018, at 04:33 (UTC).